Parkinson's disease (PD) results from the degeneration of dopaminergic neurons in the substantia nigra and the consequent deficit of dopamine released in the striatum. Current oral dopamine replacement or surgical therapies do not address the underlying issue of neurodegeneration, they neither slow nor halt disease. Neurotrophic factors have shown preclinical promise, but the choice of an appropriate growth factor as well as the delivery has proven difficult. In this study, we used a rotenone rat midbrain culture model to identify genes that are changed after addition of the neurotoxin. (1) We challenged rat midbrain cultures with rotenone (20 nM), a pesticide that has been shown to be toxic for dopaminergic neurons and that has been a well-characterized model of PD. A gene chip array analysis demonstrated that several genes were up-regulated after the rotenone treatment. Interestingly transcriptional activation of vascular endothelial growth factor B (VEGF-B) was evident, while vascular endothelial growth factor A (VEGF-A) levels remained unaltered. The results from the gene chip array experiment were verified with real time PCR and semi-quantitative western analysis using β-actin as the internal standard. (2) We have also found evidence that exogenously applied VEGF-B performed as a neuroprotective agent facilitating neuron survival in an even more severe rotenone culture model of PD (40 nM rotenone). VEGF-B has very recently been added to the list of trophic factors that reduce effects of neurodegeneration, as was shown in an in vivo model of motor neuron degeneration, while lacking potential adverse angiogenic activity. 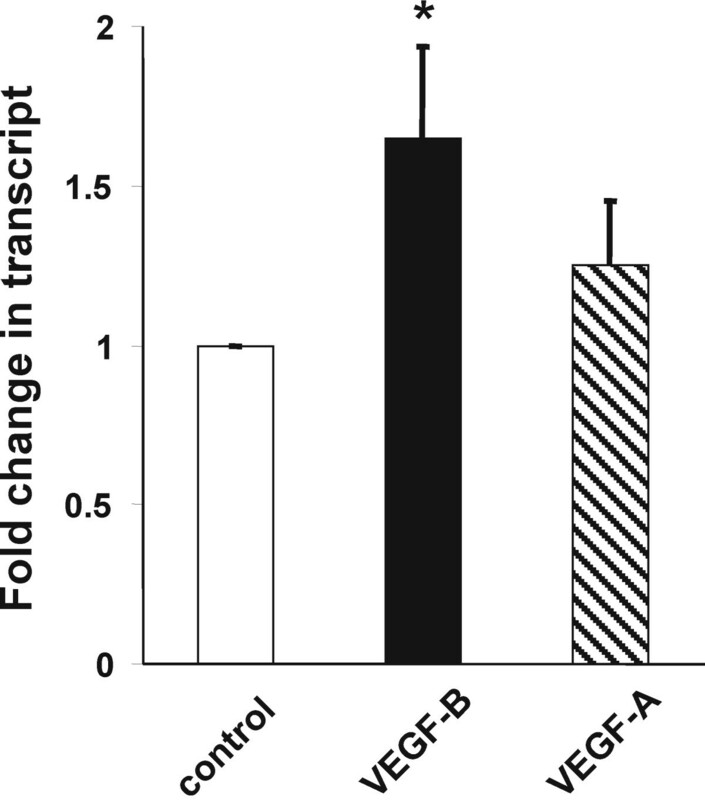 The data of an in vivo protective effect on motor neurons taken together with the presented results demonstrate that VEGF-B is a new candidate trophic factor distinct from the GDNF family of trophic factors. VEGF-B is activated by neurodegenerative challenges to the midbrain, and exogenous application of VEGF-B has a neuroprotective effect in a culture model of PD. Strengthening this natural protective response by either adding exogenous VEGF-B or up-regulating the endogenous VEGF-B levels may have the potential to be a disease modifying therapy for PD. We conclude that the growth factor VEGF-B can improve neuronal survival in a culture model of PD. The two most pressing therapeutic challenges in PD are to (1) provide a stable level of dopamine replacement and (2) slow disease progression [1–4]. Neurotrophic growth factors such as the glial-derived neurotrophic factor (GDNF), neurturin, FGF-2 and others, have shown great promise in experimental models of PD [5, 6]. The hope is that using these factors in human PD could provide a potent disease-modifying therapy; however, clinical development of these agents is problematic . Intracerebroventricular administration of GDNF via a micro pump  and neurturin delivery via viral vector-mediated gene transfer  ultimately failed in Phase II clinical trials. These disappointing results despite robust preclinical data could be due to problems with the delivery method or choice of neurotrophic factor. One path to identify new potential modifiers of PD is by using gene chip arrays utilizing in vitro and in vivo models of PD. In this study, to identify candidate genes, we challenged rat midbrain cultures with rotenone, a pesticide that has been shown to be toxic for dopaminergic neurons and that has been a well-characterized model of PD [9, 10]. Timed-pregnant Sprague-Dawley rats were anesthetized by exposure to CO2 and sacrificed. Fetuses were removed at E17, anesthetized by cooling on ice, decapitated, and the midbrain was dissected. Details of the methods have been reported [11, 12]. Tissue culture media and sera were obtained from Gibco-BRL, Grand Island, NY. The procedure was approved by the IACUC at the University of Arizona and conformed to the guidelines of the National Institutes of Health. The number of animals used and their suffering was minimized. We developed protocols in vitro using rotenone (Sigma-Aldrich, St. Louis, MO) to produce damage to dopaminergic neurons by adding it at the indicated concentrations at day 6 in culture. In previous work , an initial rotenone concentration response curve was established and the LD50 for 5 day exposure was found to be 25-50 nM. We chose to look at a slightly lower concentration of rotenone (20 nM), since we were interested in changes in mRNA before the cells are lost. We isolated the mRNA of 11 day old cultures 5 days after the rotenone challenge, and of untreated control cultures, before performing a gene array analysis (n = 3 separate experiments). The RNA isolation was done with the Qiagen RNA kit (Qiagen, Valencia, CA), using the manufacturers protocol. The gene array analysis was carried out using the GeneChip Rat Genome 230 2.0 Array (Affymetrics, Santa Clara, CA) and standard procedure. Data was analysed using the limma software package [13, 14]. Thirty-eight genes were up-regulated (using adjusted P = 0.025 and B = 2.5 as cutoff value; Table 1) after the rotenone treatment, and transcriptional activation of VEGF-B, but not of VEGF-A was evident. The results from the gene chip array experiment were verified with real time PCR (Figure 1), using β-actin as internal standard. Oligonucleotide primer sets that had been previously optimized for quantitative PCR. The PCR was perfomed on an ABI 7300 system (Applied Biosystems Inc., Foster City, CA). Up-regulation of VEGF-B transcript, but not of VEGF-A transcript, after rotenone (20 nM) treatment of midbrain cultures. The fold-increase of transcript vs. control as determined with real time PCR is shown as mean ± s.e.m for VEGF-B (black bar) and VEGF-A (shaded bar); n = 7 separate experiments. Mean fold changes in rotenone-treated cultures compared to control (± s.e.m.) were: VEGF-B = 1.65 ± 0.29; P = 0.026; VEGF-A = 1.25 ± 0.20; P = 0.40. Statistical significance was determined by a two-tail t test of ΔΔCt and difference from control is depicted by an asterisk. Oligonucleotide Primers from Applied Biosystems Inc., Foster City, CA were used: VEGF-A (Rn01511602_m1); VEGF-B (Rn01454585_g1); β-actin (Rn00667869_m1). The TaqMan® MGB probe used at a concentration of 5 μM, comprised of a FAM™ reporter dye at the 5' end and a nonfluorescent quencher at the 3' end of the probe. The solution also contained the necessary primers at a concentration of 18 μM each. List of the top 38 up-regulated genes in the gene array after rotenone treatment (genes with significance values of both the adjusted P ≤ 0.025 and the false discovery rate log-odds score B>2.5 were included in the Table; n = 3 separate experiments). The P value is based upon a t test of the average ratio of expression values for the treated and untreated samples and adjusted for multiple testing using the false discovery rate, as implemented in the Bioconductor limma library http://www.bioconductor.org. B is the false discovery rate expressed as a log odds score, so B = 3 means that there is 5% chance of being incorrect. VEGF-B is ranked 15th highest, and the B = 4.09 correlates to >98% chance that treatment is different form control. MMP9 is ranked 19th, and the B value = 3.60 correlates to >97% chance that treatment is different form control. To further validate these results a semi-quantitative western analysis was conducted. 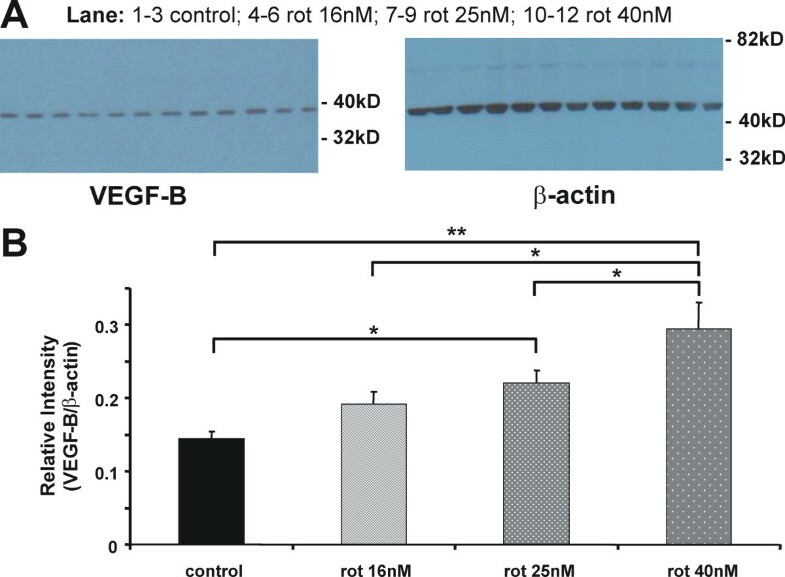 This experiment demonstrated an increase in protein expression of VEGF-B relative to the housekeeping β-actin protein after rotenone reaching significance at 25 nM rotenone. The highest rotenone concentration (40 nM) did lead to the highest expression of VEGF-B (Figure 2A and 2B). Semi-quantitative western analysis of VEGF-B expression. Midbrain cultures were exposed to 3 concentration of rotenone (16 nM, 25 nM and 40 nM) for 5 days. Protein was isolated and a western analysis was performed using a procedure previously published . We used the expression of the house keeping β-actin protein (anti-β-actin antibody from Sigma-Aldrich, St. Louis, MO) as the internal standard for the relative quantification of VEGF-B protein levels (anti-VEGF-B antibody from Santa Cruz Biotechnology, Santa Cruz, CA). A concentration-dependent increase in VEGF-B protein level was evident. In (A) example western blots for VEGF-B (on the left) and β-actin (on the right) are shown; the samples were run in triplicate. This was repeated with 3 separate preparations. The summary graph in (B) depicts the mean relative VEGF-B level (± s.e.m.) that was determined by densitometry using Image-J (Wayne Rasband, Bethesda, MD). Statistical significant differences from control were determined by one-way ANOVA followed by a Fisher LSD post hoc test, and are depicted by asterisks (*P < 0.05, **P < 0.001). 40 nM rotenone induced a significantly greater increase than 16 nM and 25 nM rotenone (*P < 0.05). The statistical analyses were conducted using SPSS software, version 16.0 for Windows (SPSS, Chicago, IL). With all techniques we saw a significant increase of VEGF-B after rotenone challenge, while there wass no significant change in VEGF-A mRNA level. This struck our interest in light of the recently published results from Poesen et al., 2008 , proving VEGF-B to be an inducible trophic factor in a model of neurodegeneration of motor neurons. VEGF-B is a member of the VEGF-family of trophic factors [16, 17]. VEGF-A is the best studied member due to its strong angiogenic activity and potential for cardiovascular and cancer research . VEGF-A is up-regulated in the substantia nigra but not in the striatum of PD patients . VEGF-B, on the other hand, stimulates proliferation of neuronal cultures in vitro , and has not been investigated in PD. VEGF-B has also recently been shown to be neuroprotective in motor neuron degeneration in vivo . It had previously been shown to inhibit apoptosis and having only minimal angiogenic activity  while being critical to survival of the blood vessels . This is important since efforts to use VEGF-A as a neurotrophic or a neuroprotective factor had been hampered by the strong angiogenic activity. Although neuroprotective effects of VEGF-A expressed by cells or viral vectors in models of PD were reported [23–25], they were over-shadowed by detrimental effects such as edema, ventriculomegaly  and disruption of the blood brain barrier . These negative side effects were not seen when using VEGF-B in vivo . Interestingly, the neuroprotective effect of VEGF-B in vivo was also restricted to pathological conditions. Mice lacking VEGF-B displayed normal motor behavior, but, when challenged in a model of neurodegeneration, they displayed a more severe form of motor degeneration . Loss of VEGF-B also enlarges stroke . These data suggest that VEGF-B plays a role in compensations for natural disease processes of the nervous system. It does so by binding to its only receptor VEGFR1 , a receptor with not yet delineated downstream signaling events. Further analysis of our gene array data showed the only up-regulated gene with known interaction with VEGF-B was matrix metallopeptidase 9 (MMP9). VEGFR1 signaling has been previously linked to the induction of MMP9 in lung endothelial cells  suggesting a potential role of MMP9 in the effects of VEGF-B that should be further investigated. The fact that dopaminergic neurons make up less than 5% of the cells in our midbrain preparation argues against an up-regulation of VEGF-B only in dopaminergic neurons. We therefore hypothesize that the VEGF-B may be released by the astroglia in the preparation rather than the dopaminergic neurons themselves. Further evidence supporting this hypothesis comes from recent experiments where rotenone treatment in vivo did not cause transcriptional activation of VEGF-B in dopaminergic neurons analyzed after laser-capture microdissection . In addition, under healthy conditions, motor neurons express VEGF-B to maintain neuroprotection in an autocrine manner, whereas astrocytes may express VEGF-B after injury to maintain survival in a paracrine manner . A similar paracrine scenario is possible in the PD-like neurodegeneration induced in our model system. This hypothesis should be tested in the future. Taken together with our data showing an up-regulation of VEGF-B after rotenone challenge to rat midbrain cultures, these data lead to our hypothesis that VEGF-B may act as an endogenous trophic factor against the neurodegenerative insult in a model of PD. We investigated the trophic activity further by adding exogenous VEGF-B167 (0.5-50 ng/ml; R&D-Systems Inc., Minneapolis, MN) to midbrain cultures on day 6 (VEGF-B167 is the more abundant of 2 splice isoforms, VEGF-B186 being the other). The cultures were fixed on day 11 and dopaminergic cells were analyzed by tyrosine hydroxylase (TH) immunocytochemical staining . Neuronal numbers were determined by visual observation of randomly chosen fields at 400× magnification, viewed with fluorescent optics to determine immunostained dopaminergic neurons and with phase contrast to determine total cell number. We saw a mean treatment effect of 30% increase in TH-positive cell number per culture dish as compared to the untreated cells, with a trend apparent at 2.5 ng/ml, and statistical significance at 10 ng/ml. The mean effect remained the same at the highest tested concentration at 50 ng/ml (Figure 3A). An experiment using 5 ng/ml of VEGF-B186 showed also a significant effect (data not shown). This is likely due to improvement in the native in vitro survival of the dopaminergic neurons under artificial culture conditions. Over the course of time in vitro, the total number of neurons usually decreases. This is characteristic of primary neurons in culture and likely reflects normal developmental apoptosis and the absence of the full complement of neurotrophic factors. A less likely explanation could be stimulation of neurogenesis, but this has not been demonstrated in the substantia nigra as it has been for the subgranular zone of the hippocampal dentate gyrus . In a second series of experiments we tested additional exogenous VEGF-B in the midbrain culture model using a severe challenge. Exposure to rotenone (40 nM) for 5 days in culture led to a significant reduction of TH-positive neurons per culture dish by 50% (P < 0.05). A neuroprotective effect against the rotenone challenge on TH-positive neurons was evident (Figure 3B) with pretreatment with VEGF-B167 (22.5 ng/ml) 1 hour prior to the toxin. 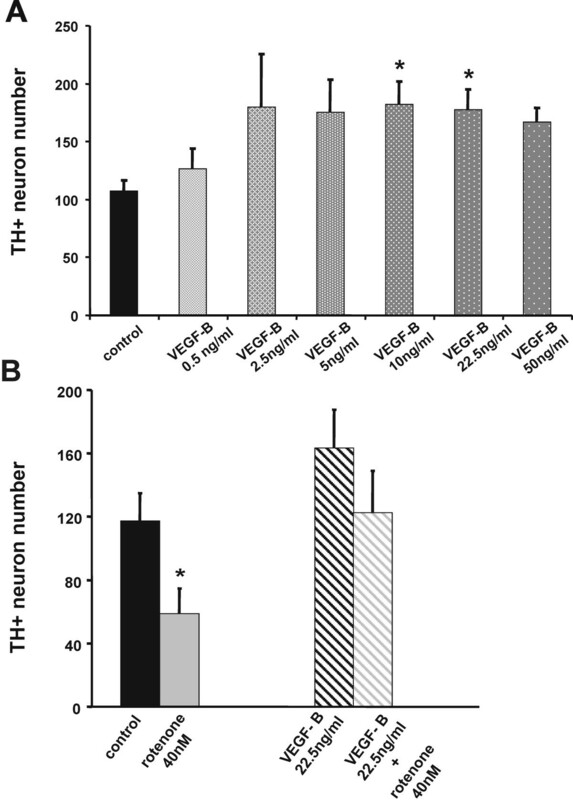 (A) Neurotrophic effect of VEGF-B 167 on cultured rat midbrain dopaminergic neurons. Mean count (± s.e.m.) of TH-positive neurons after immunocytochemical staining is plotted. Fluorescent images were acquired digitally on an Olympus IX70 inverted microscope and camera using Olympus MagnaFire software. Morphometric analysis was carried out using Image-J (Wayne Rasband, Bethesda, MD). Antibodies were obtained from Chemicon, Temecula, CA. As compared to untreated control cultures (n = 22 culture dishes) a significant increase in the TH-positive neuron number per culture dish after addition of VEGF-B was apparent. The effect of VEGF-B on TH-positive cell number was concentration dependent. At 0.5 ng/ml (n = 8) no change was noticeable. At 2.5 ng/ml (n = 6) and 5 ng/ml (n = 10) a trend was evident, that reached a statistical significant level at 10 ng/ml (n = 12) and 22.5 ng/ml (n = 11). The mean effect remained the same at the highest tested concentration at 50 ng/ml (n = 4, P = 0.051). Culture dishes were from 5 separate preparations. Data are plotted as mean ± s.e.m. (*P < 0.05; one-way ANOVA followed by a Games-Howell post hoc test to account for small group size and heterogeneity of variance). The statistical significant differences from control are depicted by asterisks. (B) Neuroprotective effect of VEGF-B in a severe rotenone rat midbrain in vitro PD model. As compared to the untreated control cultures (n = 17; black bar) the TH-positive neuron number was reduced after addition of rotenone (40 nM; n = 11; gray bar on the left), this cell loss was rescued by adding 22.5 ng/ml VEGF-B167 (VEGF-B+40 nM rotenone; n = 9; gray patterned bar on the right) prior to rotenone (22.5 ng/ml VEGF-B only cultures; n = 9; black patterned bar). Data are plotted as mean ± s.e.m. (*P < 0.05; one-way ANOVA followed by a Fisher LSD post hoc test). The statistical significant difference from control is depicted by an asterisk. Culture dishes from 5 separate preparations were used. Neurotrophic factors are promising agents to provide disease modification for PD. This report demonstrates that VEGF-B is a new candidate trophic factor distinct from the GDNF-family of trophic factors, and is activated by neurodegenerative challenges to the midbrain. Strengthening this natural protective response by either adding exogenous VEGF-B or up-regulating the endogenous VEGF-B levels may have the potential to be a disease modifying therapy for PD. Based on the literature, the VEGF-B186 isoform is more diffusible than VEGF-B167 in vivo [15, 31], and therefore may have a greater therapeutic potential. We conclude that the growth factor VEGF-B can improve neuronal survival in a culture model of PD. Torsten Falk, Shiling Zhang contributed equally to this work. Institutional Animal Care and Use Committee. TF helped to design the study, analyze data and wrote the manuscript. SZ executed the experiments and helped with design and data analysis. SJS designed the study and contributed to writing the manuscript. All authors read and approved the final manuscript.